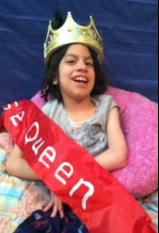 The 2014 Fiesta Especial® Royal Court is made up of 10 individuals representing 5 organizations that serve children and/or adults with disabilities. Serving on the Fiesta Especial® Entourage, there are another 4 individuals, representing 2 organizations. These 14 individuals will represent Fiesta Especial® in the community throughout the Fiesta® season demonstrating to others the abilities of all individuals to achieve their dreams...bringing visibility to the leadership and contributions individuals with disabilities make in our community each day. The 2014 Fiesta Especial® Royal Court and Entourage raised over $9,615 for programs and services that benefit children and adults with disabilities in San Antonio. We couldn't be more proud to be associated with such fine individuals! Collin and Katrina of Job Adventures raised $2,800 for children and adults with disabilities! 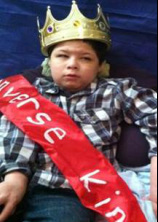 Collin is the homecoming king at McArthur High School. Where ever he goes he smiles, shakes hands and has the utmost royal, debonair personality. Collin is loved and respected by his classmates, family and friends. He always puts a smile on everyone's face. When asked about his feelings toward his candidacy this year, Collin responded "I would like to be Fiesta King because I am handsome, I am smart, and love all the Fiesta dances. I am a good dancer, I have been to Fiesta every year since I was born. I love to see all the people and wave at the fans. Fiesta is the best party ever. " 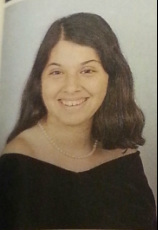 Katrina is a graduate of Burbank high school where she was the stat keeper for the basketball team. She graduated from Job Adventures where she was the only female student out of 17. Being the only female she was not shy and always volunteered to assist others. She is loved and well respected in her community. Katrina loves help others. When asked about her feelings toward her candidacy this year, Katrina responded " I enjoy participating in many events. 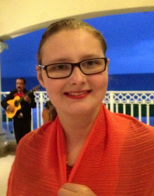 I enjoy helping people and want to bring awareness to people with disabilities." Catherine and Leah of Monarch Academy raised $1,500 for children and adults with disabilities! Leah is a 13 year old at Monarch Academy. she is actively involved at her church, The Park, where she enjoys helping in children's church. She loves cooking and dreams of opening her own restaurant called "Leah's Cafe." Her hobbies include making movies, doing interviews and really wants her own green screen. When asked about her feelings toward her candidacy this year, Leah responded "I like to dress up." 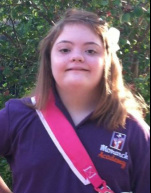 Catherine is an 18 year old student at Monarch Academy. She likes to work in the garden at school and she loves all things pink. Catherine is kind and considerate and a real "girly girl." She is outgoing and love to dance. Catherine is always smiling and will brighten anyone's day. When asked about her feelings toward her candidacy this year, Catherine responded "I want to be a Princess for Fiesta!" Steven and Karry of Alliance of Pediatric Providers raised $2,000 for children and adults with disabilities! Steven is a sophomore at Wagner High School in the Judson ISD. He participates in Special Olympics. He competes in flag football, bowling and track and field. He has a very outgoing and loving personality. Steven loves to dance to all different types of music ranging from country to Tejano. Some of his favorite bands and performers are Michael Jackson, Albert Zamora, the Temptations, and Flaco Jimenez. In his spare time, he likes to play his musical instruments while listening to music. Steven is a friend to everyone and has a kind heart. When asked about his feelings toward his candidacy this year, Steven responded "I am excited to be able to meet a lot of new people." Karry is currently in 10th grade and enjoys playing soccer, basketball and going bowling. Her big heart recently earned her an award for compassion for her help with another student during an overnight trip. Karry likes to think with her heart and help those who are lonely or hurt while always sporting a big smile on her face. Karry is a loving, caring young lady that never likes to see any one hurt or lonely. She also loves to donate items to different donation stations. When asked about her feelings toward her candidacy this year, Karry responded "I cannot wait to be a part of Fiesta and spread love to everyone around me." David and Lizzie of SpeciaLives raised $1,549 for children and adults with disabilities! David is a graduating Senior at the Nellie Reddix Center. David received an Art Recognition Award, 2nd place, and is doing extremely well at school. He enjoys hiking, biking, and being with friends. When asked about his feelings toward his candidacy this year, David responded "I want to make friends and meet more and more people." Lizzie is in her first year at Nellie Reddix. Lizzie has served on the Fiesta Especial Royal Court for the past 2 years and has seen the experience as an opportunity to represent fellow-students and friends. She loves her role in this program and asked to run for a position again for the 3rd year. Lizzie is involved in the newly created Nellie Reddix Dance team and is looking forward to performing at Fiesta Especial events. When asked about her feelings toward her candidacy this year, Lizzie responded "I like to meet all people!" Braeden and Annabelle of Converse Elementary raised $778 for children and adults with disabilities! Braeden Constancio, Age: 9, Representing Converse Elementary Special Ed. Braeden works hard at school and enjoys time with his friends. He is an awesome brother to Rueben and Layla. When asked about his feelings toward his candidacy this year, Braeden responded "I want to show the world all that I can do." Annabelle Dominguez, Age: 10, Representing Converse Elementary Special Ed. Annabelle is a social butterfly and is a hard working student. She works well with classmates and lights up a room with her smile and laugh. When asked about her feelings toward her candidacy this year, Annabelle responded "I want to bring smiles to people's faces." Seth is of great moral character. He attends NETS where he is taking a money management class, a computer class and seeking employment daily. When he is not attending NETS, Seth is volunteering at Brighton Center in the offices. He loves to spend this time with the babies as well as help in the offices. He is a Special Olympian who loves to bowl, play basketball and run track. He is well known in the community for his kindness and excellent manners. 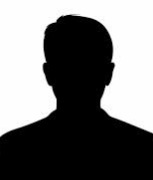 He attends Woodland Baptist and is in the youth group where he participates in youth mission trips and Habitat for Humanity work. Seth also participates in many nonprofit groups such as the Epilepsy Foundation and Down Syndrome Association's Buddy Walk. When asked about his feelings toward his candidacy this year, Seth responded "I want to learn more about my city and represent Brighton Center as the Fiesta King. 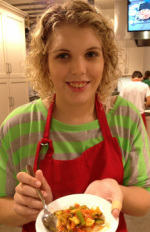 I want to show people that individuals with disabilities can make a difference." Vanessa has overcome many difficulties. She participates in Special Olympic games including bowling, basketball and softball. She won the gold medal in the world Games Special Olympics in the Athens Greece games of 2011. Vanessa is currently selected to go to the National Games in New Jersey this coming June, 2014 for basketball. She went to college at SAC and received her child development certificate. When asked about her feelings toward her candidacy this year, Vanessa responded "I believe that we are all equal no matter what our disability is. I believe that I can represent people with disabilities because I have one myself." Jacob is very much involved in his community. He is an active volunteer with the B Cycle Organization downtown, who manage and provide bikes for people to rent to enjoy the renovated riverwalk. Jacob also volunteers with Cub Scout Pack 252 and helps the pack as needed. 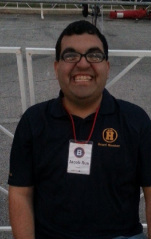 Jacob leads by example, and does not let his Intellectual Disability stand in his way. He is a role model for the entire community and is the definition of hard work and dedication. When asked about his feelings toward his candidacy this year, Jacob responded, "I want to be involved in the community and help others realize their dreams, the same way people have helped me realize my own." Abrianna always thinks of others first. She believes that you can do anything you put your mind to. Abrianna is one that will never give up and always dream about what she can do. When asked about her feelings toward her candidacy this year, Abrianna responded, "I want to let others know you can accomplish anything. Everyone is special and I want others to know that I believe in them." March 1, 2014: The 2014 Coronation will take place at the Hand-in-Hand, A Night on the Runway event benefiting Monarch Academy and Morgan's Wonderland on Saturday, March 1st. Click Here for tickets ($50/person). March 22nd, 2014: Fiesta Especial® Royal Court Meet & Greet will take place at Mi Casa Tamales from 5pm - 9pm. Free and open to the public, this is a wonderful opportunity to meet the 2014 Royal Court. Activities for kids! Bake Sale! Fiesta Fun! Click here for more details. April 5th, 2014: Fiesta Especial® 5K & Parade will take place starting at the City Hall in Windcrest at 8am & 9am respectively. Click here for 5K Registration or Parade Registration. The parade is free to spectators. April 17th, 2013: Fiesta Especial® Carnival will take place in Alamo Dome Lot C from 10am - 3pm. Advanced Registrations Required. Free to individuals with disabilities and their companions.